Howdy guys! Happy Friday! Are you as excited for the weekend as I am? Ah! So bright! Ready to get started?! Love It When You Call Me Big Papaya is a bright, coral-orange creme with golden shimmer and subtle, darker purple shimmer. Formula: It's on the thicker side, creamy, and quite easy to control. The first coat is not even streaky at all, which is actually very impressive for a neon this color. Dry-down is quick, and two coats are mostly opaque with slight VNL. I had no problems with dragging or pulling, and overall this is a great formula! 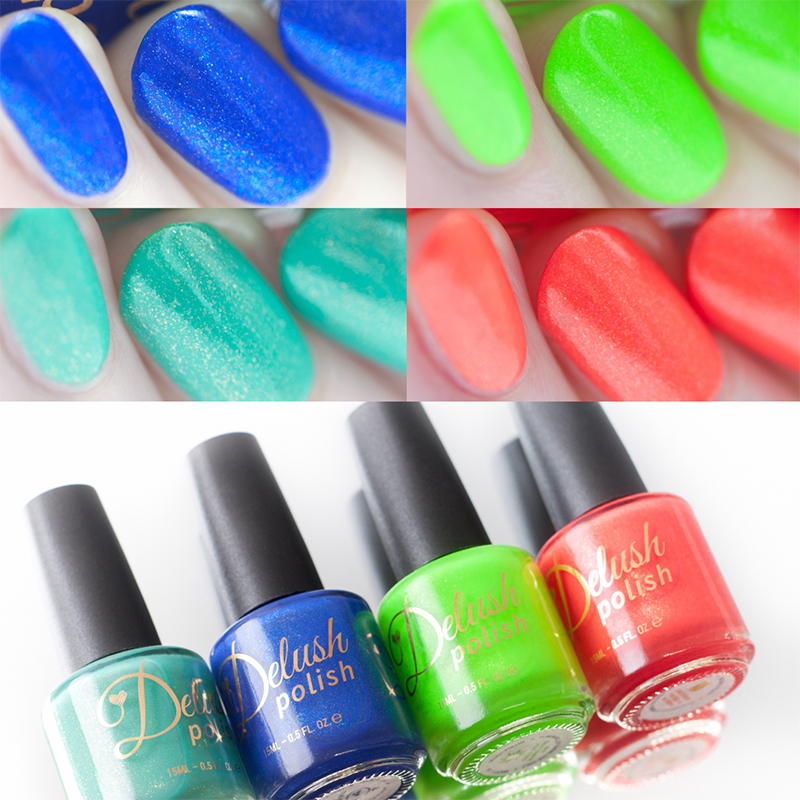 Girls Just Wanna Have Sun is a neon, green-leaning lime with tiny gold-yellow-green color-shifting flakie shimmers. Super bright, definitely the neon-est neon of this bunch! Formula: It's got a similar consistency and brush-feel to Love It When You Call Me Big Papaya, and is easy to control as well. The first coat is slightly streaky, but overall this is pigmented and covers well. It glides on, and I had no problems with pulling/ dragging. This does build well, but I still needed three coats for even, opaque coverage. I feel like this one could self-level a bit better, but once you put top coat on, it doesn't matter at all. Splash Me If You Can is a teal-leaning turquoise with glassfleck gold shimmer and subtle color-shifting flakies. This has a bit of a swampy, warm tropical feel, and I think it's lovely! Formula: This one seems slightly sheerer than the first two, and the consistency is also not as thick (although still creamy). That said, it's not runny either, and smooths over the nail, easy to control. The first coat is sheer but not streaky, and dry-down is similarly fast. The second coat still has VNL, but this self-levels so well that it's completely wearable this way. I preferred three coats, but this is nice at two as well. Tide Of Your Life is a bright, cobalt base filled with fine-milled linear holo shimmer and some tiny, subtle color-shifting flakies. So rich and beautiful! Do you love cobalt? I love cobalt- especially on my nails. It's a go-to color for me, and this cobalt is a must-have! Formula: It's very similar to Splash Me If You Can in texture and pigmentation, but builds a little faster to opacity. I only needed two easy coats for this one (dry-down is fast), and the formula was easy to manipulate, no issues with pulling/ dragging, ect. Very, very nice! All that said about the particles, you will need top coat in order to bring out the shimmery goodness since these shades all dry matte to semi-matte. (All of my swatches are shown with top coat here.) Formula-wise, all of these were easy to manipulate, dried down super quickly, and just in general were a joy to use- which, for neons, is impressive! Have you tried any of the other shades from this collection? Which is your favorite here?